#RNLI - Wicklow RNLI launched in the early hours of yesterday morning (Friday 2 May) to bring a yacht and its crew of three to safety. The volunteer crew launched their all-weather lifeboat at 2.57am in response to a call for assistance from an English yacht with three people on board some 23 miles north-east of Wicklow Harbour. The alarm was raised after the skipper of a yacht contacted the coastguard to say he was unable to make any headway due to insufficient wind, and was having difficulties after the boat’s engine had failed. The lifeboat, under the command of coxswain Tommy McAulay and five volunteer crew members, located the vessel at 4.20am. A towline was passed and the casualty was towed into Wicklow Harbour, arriving safely at 6.55am. Speaking following the call out, Wicklow RNLI lifeboat operations manager Des Davitt said: "Our volunteers are always on call and prepared to respond to any emergency at any time. "We were delighted to be of assistance at this early hour and were glad to be able to bring these three people and their yacht safely to shore." 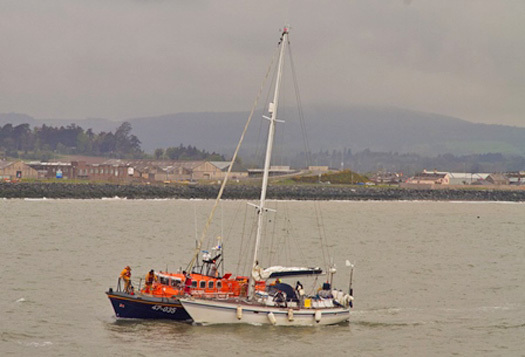 The lifeboat crew on the call out were coxswain Tommy McAulay, mechanic Brendan Copeland and crew members John Vize, Tommy Murphy, Connie O Gara and Alan Goucher.